Pioneers in the industry, we offer ginkgo biloba extract from India. We are rated as the topmost manufacturer and supplier of Ginkgo Biloba Extract and have carved a niche for ourselves in the market. It has several medicinal and healing properties. One of the oldest living species of plant on earth, Ginko is more than 225 million years old and has been one of the ten best selling herbs since the past 5 years or more. They are sourced from reliable vendors and processed in our state of the art facilities under t he supervision of our experienced agriculturists. 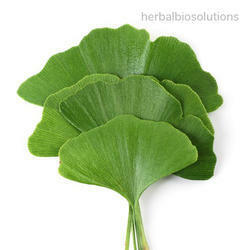 The standardized extract of ginkgo leaf is presently one of the most frequently used plant -based medicines in Europe. The constituents included in these extracts include gibberellins, cytokines like substan ces, ginkgolic acid, bilobol, ginnol, aspartin e and calcium. The leaves are primarily used for cerebral circulation. They are widely popular and mainly used in making tea, capsules and are also used in conjunction with other extracts to create different products; medicinal and otherwise.This natural herb has a long history in Chinese medicine. They are widely used in making nuts and ginkgo leaves are used to treat lung conditions (rather than mental conditions). They are sweet to taste, have astringent prop erties and are non -heating products. They are instrumental in stopping "leakage" of fluids into air passageways without creating heat, increased heartbeat or excitability. The leaves of Ginko stimulate the blood circulation and have a tonic effect on the brain thereby reducing lethargy, improved memory as well as an improved sense of well -being.